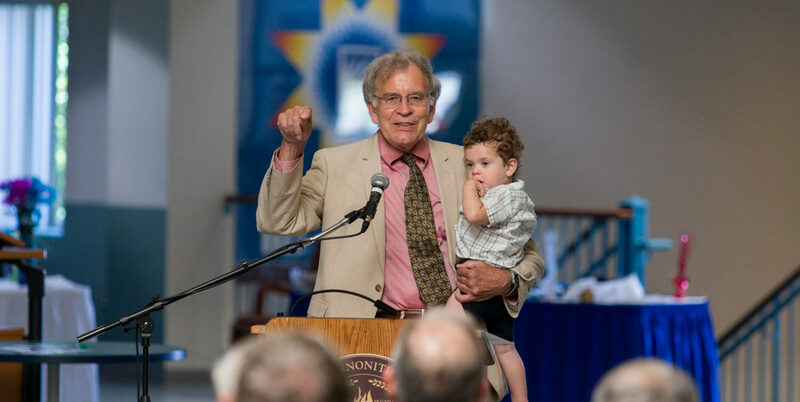 Holding his 19-month-old grandson, Ray Martin told the audience gathered at Eastern Mennonite University (EMU) Thursday afternoon why he had made a generous donation to study and combat the issues of climate change. The Center for Sustainable Climate Solutions, launched Thursday with a $1 million donation from Martin, will aid that goal. Led by EMU, the center will also include Goshen (Indiana) College and Mennonite Central Committee as founding institutions, with additional partners expected to join later. Collaboration with other like-minded groups and organizations will create “an impact felt much beyond Mennonite circles,” he added. An oversight board, chaired by EMU provost Fred Kniss, is developing more concrete plans and objectives for the Center. Kniss said the work will focus on four areas: connecting with a national and global network, researching best practices, educating by sharing findings, and innovating through new ideas and methods. Members of the oversight board and leadership team gather. Each of the three founding partners will have two representatives on the oversight board, with Deidre Smeltzer, vice president and undergraduate academic dean, and Jim Yoder, professor of biology, serving as the EMU representatives. The interim EMU leadership team that will guide the work includes Jenni Holsinger, associate professor of sociology; Jonathan Lantz-Trissel, sustainability coordinator; Scott Barge, director of institutional research; and Jack Rutt, special projects support for the provost’s office. The oversight board expects to select a permanent director to start in fall 2017. The new initiative fits well with a Mennonite tradition of “transformative education,” said Interim President Lee Snyder. The Rev. Mitch C. Hescox, president of Evangelical Environmental Network, was present for the afternoon ceremonies. Among those present to celebrate the launch were members of the climate change activism community, including The Rev. Mitch C. Hescox, president of Evangelical Environmental Network; Karen Leu, program coordinator of Interfaith Power and Light; and Charlie Strickler, co-founder of Climate Action Alliance of the Valley, and several other members; and Tom Benevento, of New Community Project. Martin, a native of Lancaster County, Pennsylvania, who now lives in northern Virginia, attended Eastern Mennonite College from 1959 to 1961 before finishing his bachelor’s degree in economics at Goshen. He went on to a long career in international development and global health work through USAID, the World Bank and other organizations. Martin said he selected EMU to lead the effort due to his familiarity with the school, which was “hugely formative” in his life, along with EMU’s longstanding commitment to sustainability and its innovative, “cutting-edge” spirit with initiatives like the Center for Justice and Peacebuilding and leadership for the Collaborative MBA program. Martin cited capital projects and curricular alignment as two overt signs of EMU’s commitment to sustainability. The campus has one of Virginia’s largest commercial-scale solar arrays atop Hartzler Library, as well as LEED-certified residence halls and other energy-efficient buildings, and five campus gardens. Kenneth Newbold, Goshen College provost, visits with EMU Interim President Lee Snyder. With Mennonite Central Committee, Goshen College is a partner in the new center. Mennonite Central Committee (MCC), meanwhile, received another major gift from Martin this past year to start a maternal-child health project in memory of Martin’s wife, Luann. MCC East Coast region executive director Bruce Campbell-Janz says he looks forward to partnering with the climate change effort, as well. Quoting scripture from Hebrews 10, which encourages the church to “provoke one another to love and good deeds,” Campbell-Janz thanked Martin for his “holy provocation” on this issue. Likewise, Goshen College – which operates the Merry Lea Environmental Learning Center and provides leadership for the Mennonite Creation Care Network – sees this new effort as a natural place for partnership. Kniss, his EMU counterpart, said the oversight board will “flesh out” next steps in the coming months. An additional advisory board of experts will provide further input, and a broader consultation with partners is planned for spring 2017.